Equipped with pipe cleaners, pom poms, and a PowerPoint presentation on basic genetics, members of the 23andMe Education team headed back to school last week. 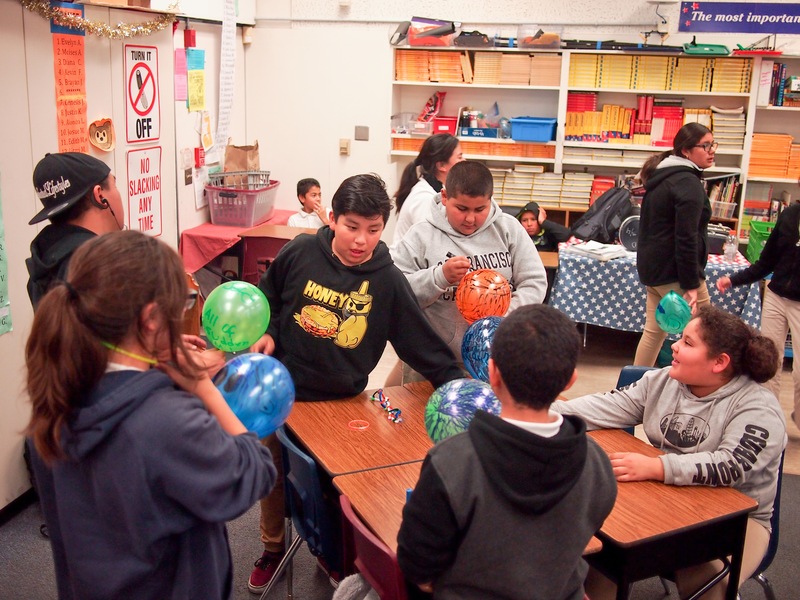 The team was at Hoover Community School in Redwood City, to impart the basics of genetics to 6th and 7th graders, who are part of an after school program. 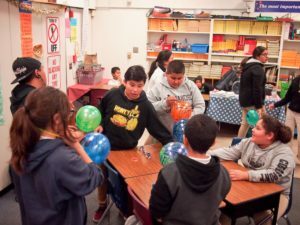 It’s the kind of extracurricular learning that’s not always available for these students, said David Cruz, who helps with the after school program and is the manager of development and corporate partnerships for the Boys & Girls Clubs of the Peninsula. 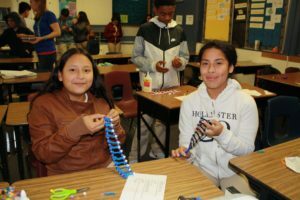 “It is important that low income students at the Boys & Girls Clubs receive these types of unique experiences to explore topics of ancestry and genetics, too often they are not presented with these opportunities at home or at their schools,” Cruz said. The students also taught our team from 23andMe a few things about having fun. The afternoon started with the students playing a little game meant to illustrate how genetics influence physical traits like hair texture, eye color, freckling and tongue rolling ability in a population. Some of the funniest moments centered on an activity meant to figure out who could roll their tongue. It involved students sticking out their tongues, and seeing who could roll their tongues and who couldn’t. The fun continued with students examining their ears, checking to see who had attached or detached earlobes, another inherited trait. The education team gave a brief presentation on the basics of DNA, followed by some additional interactive activities. Applying lessons learned from the presentation, students wore glow-in-the-dark bracelets in four different colors to represent their As, Cs, Ts, and Gs — the four DNA bases that are the building blocks of DNA. Using what they learned in the lesson about complementary base pairing rules, the students paired with their complimentary color to form their own parallel DNA sequences and simulate the DNA replication process. 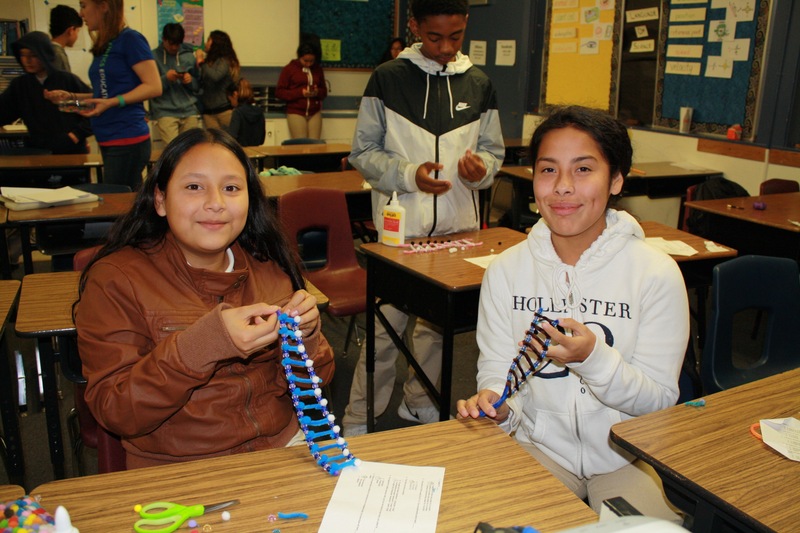 To illustrate how DNA is constructed and how the nucleotide bases pair with one another, the students created a double helix ladder using pipe cleaners as the sugar-phosphate backbone, and small fabric pom poms, or pony beads, as color-coded base pairs. Then it was on to diagramming inheritance on paper using something called Punnett squares, which are used by biologists to determine the probability of an offspring having a particular genotype. In this case the students also used Easter eggs to illustrate the process, cracking open two one for mom and one for dad. Each egg contained a random combination of alleles for the genes that code for hair texture, eye color, and lip thickness. Students completed Punnett squares to determine the traits for the offspring of the eggs. Using the inheritance model as a guide, students decorated trait balloons with markers to illustrate the eye color and lip thickness, and yarn to simulate hair texture. For one student, the exercise helped her understand why her aunt and uncle have brown eyes, but her cousin,their child, has blue eyes! The most popular activity was a brief guessing game on the length of DNA inside a single human cell, using a piece of yarn to physically show the length. Before revealing the full section of string, students offered hypotheses ranging from a few inches to two football fields. Most were surprised at the actual length: approximately 6 feet! Although we were there to inspire interest in science and genetics, we also left inspired by the level of enthusiasm and curiosity among the students. Many asked thoughtful questions, like: How does genetics influence cancer? Can we use DNA to clone humans? What do genes have to do with diabetes? Can genes make someone do bad things? At times, attention briefly veered off course. It’s tough to focus on genetics for a full three hours, especially after a full school day. Balloons were popping, pom poms were flying, and during a brief moment in one classroom after several unsuccessful attempts to restore attention, one student near the back was able to focus the entire group when upon finishing his model, he gave an excited shout and held up a perfect pipe cleaner double helix. The afternoon finished with fun gifts for everyone: each student received a complimentary Tech Museum ticket (thanks to Barry Starr at the Tech Museum), candies, stickers, and pins. Each teacher received a genetics-themed T-shirt and each classroom received two free You Share Genes with Me and The One and Only Me books. The afternoon built on a similar event 23andMe participated in last year, visiting students at the Boys & Girls Club adjacent to Hoover for a program affiliated with the school. This year’s program doubled in size with 70 participating students and teachers, said Cruz. The day was part of the 23andMe Education team’s mission to facilitate genetic literacy at all levels. Thanks again to the teachers, administrators, and most importantly the students at Hoover for welcoming us into their world for an afternoon. We learned a lot!